While the financial planner performs much of the work, the client must be committed to the process and fully participate at each step. If the client doesn’t “own” their financial plan, it will not get implemented, or it will be abandoned during the inevitable bumps in the road. 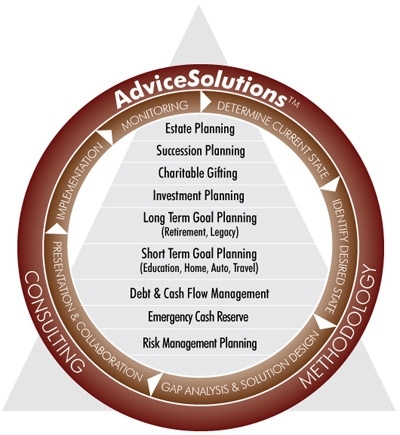 The elements of our comprehensive financial planning services are summarized below. Our services are oriented toward developing written strategic financial plans for solving specific problems and/or reaching specific goals depending on family or business needs. Please note that we also utilize tax reduction strategies in our planning. Understanding the tax implications of an action is an essential component of every plan, but is typically a secondary consideration. An action must make sense outside of the tax implications to be considered a viable strategy. During our financial planning process, we will prepare personal Net Worth and Cash Flow statements. In addition, we will review your debt, emergency cash reserve, and savings levels and calculate personal financial ratios to help assess your progress toward basic financial goals. Every one of us faces a host of risks every day. Driving a car, eating in a restaurant, crossing a busy street, owning property, and sometimes just breathing constitute acts of faith that can carry significant risk. When adverse events cause losses that can be quantified in dollars, we can anticipate them and manage them to mitigate the consequences. Our insurance analysis services will help inventory and assess areas of risk for our clients and provide recommendations as to how best to manage the risk. Managing risk can be done in several ways. There are many challenges to face when looking for the best education for a child you love. Paying for it is probably the biggest challenge – and one that needs to be addressed early. There are many options when saving for education and each has advantages and disadvantages. The most important goal on many of our client’s minds is retirement. Considering that many retirees will live thirty-five or more years in retirement, it’s not surprising that it is the most important financial goal most people have. But retirement is about much more than just money. The concept of retirement is changing. And so are the ways that people prepare for it. For some, retirement means lots of leisure time to pursue hobbies and interests. For others, it means a change to part time work, and still others will spend their new found free time with family members or as a volunteer in the community. Whatever your plans for retirement may be, we are here to help you prepare financially for what could be the most rewarding part of your life. We can help you determine the most effective vehicles to use in saving for your retirement. And we can help you determine whether you will have sufficient resources to support the lifestyle you desire. If there is a gap in your plan, we can identify your options and develop a plan to help you achieve your goal. What most people don’t realize is that managing money during retirement (while they are spending it) is very different from managing money before retirement (while they are accumulating it). For decades, they have been told that they need to get more conservative and move the majority of their investments into fixed income securities just before, or at retirement. But for many people, this is the riskiest thing they could do. We work with you to understand your situation, educate you where necessary, and develop as well as implement a retirement distribution plan that provides you with a sense of security. Estate planning is quite simply, the process of preparing, in advance, so that at your death your assets are transferred to the person(s) and charities you want, with minimal delay and cost. An effective estate plan takes the coordinated efforts of you and your advisors. At Engler, Garrow & Roth, Ltd., we work extensively with you, your attorney, and your tax advisors to develop and implement an effective estate plan that helps accomplish your goals. The breadth of estate strategies range from strategic asset titling and optimizing exemption amounts, to sophisticated charitable giving strategies. Whatever your objectives, you can be sure that the planners of Engler, Garrow & Roth, Ltd. can help you define and understand your options and will work hand-in-hand with your other professional advisors to implement your estate plan. Engler, Garrow & Roth, Ltd. does not give legal, tax, or accounting advice. Consult your accountant, attorney and/or tax advisor for specific advice. Investing is only one component of financial planning - though certainly an important one. Therefore, we believe in developing client-specific investment plans that emphasize a classic diversification1 strategy. We further believe that an appropriate investment policy can be designed only after the initial financial planning process is complete and a target return is established. For that reason, each client has a personalized Investment Policy Statement (IPS), which outlines the unique investment strategies appropriate for the goals and objectives of that individual. We then invest the assets according to the appropriate asset allocation model as defined in the Investment Policy Statement (IPS). These models are allocated amongst the major asset classes of cash, stocks, bonds, and alternative investments such as, but not limited to, real estate, commodities, and precious metals. Furthermore, stock allocations are divided amongst stock of foreign and domestic companies as well as large, medium and small capitalizations. Bond allocations are made to both foreign and domestic government issuers and corporate bonds of various ratings and duration. We also typically utilize a variety of low correlation alternative investments in an attempt to minimize risk. Charitable giving is a way of sharing your good fortune to help others. Those assets can be cash, savings, investments, or property. The gift can be modest or significant and may be given away during life, or after death. It doesn’t matter. The important thing is to give what you can in the way that works best for you. There are many different reasons why our clients approach us for assistance with their charitable giving strategies. The main reason people make charitable gifts is to benefit the organization(s) or individual(s) who receive them. Yet there is another benefit as well. It’s the joy you experience when you make a gift that, with proper planning, can significantly help others. What’s more, in many cases, your charitable gifts may provide valuable tax benefits. These tax benefits may help you retain more of your own personal assets, meaning more financial security for you – and your loved ones. There are many charitable giving strategies ranging from basic to sophisticated. Regardless of your motivation or choice of charitable recipient, we will help clarify your goals and select the strategies that fit best with your specific circumstances. You have worked hard to build your business and keeping the family farm or business intact through the generations is of utmost importance to you. This can be accomplished if the proper planning is done in advance. Strategies can differ depending on whether your business is a Family Limited Partnership, Limited Liability Company, C Corporation, Subchapter S Corporation, or Sole Proprietorship as each has its own advantages and disadvantages. Engler, Garrow & Roth, Ltd., along with your attorney and accountant can help you decide which is best for you once we have determined your current situation and your goals for the future. We incorporate this type of planning with your Estate Plan in order to best address the concerns of continuing the business as well as providing equity to those heirs who may not be involved in the family business. Engler, Garrow & Roth Ltd. does not give legal, tax or accounting advice. We will however work with your attorney and accountant to provide you with a coordinated plan to meet your goals. We provide a complimentary initial consultation in order to determine if a client’s needs can be effectively met by our services. Our comprehensive financial planning services are available on a “plan” basis. Fees for a financial plan range considerably depending upon the elements and complexity of the plan. The basis and amount of all fees will be detailed and agreed upon before any work commences on the financial plan. The fee for a comprehensive financial plan covers the development and implementation of the plan. In addition, we will provide one year of service for the plan.